House of Silent Graves is the name I use for my crafting activities and this is a gallery of my babies so far! This is where it all started! 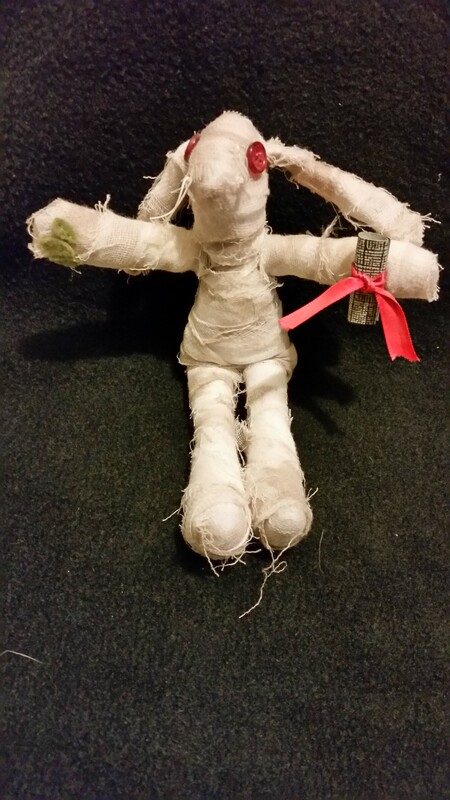 This is Im-Hop-Tep, the mummy bunny! I found a little stuffed bunny shoved in the back of a shelf at the craft store I worked at. It’s arm and leg were hanging off and he was just generally in bad shape and I felt bad and decided to buy him and fix him. Then I found a strip of mummy bandage I had in a box and, well, it had to be! I saw Beast From Haunted Cave and fell in love with Humphrass, as the monster was called by the man who built it, and decided to make on for myself. I wanted to be true to the spirit of the movie, and this is Roger Corman produced, so I set myself a budget of $5. I came it at $4.25, which I think Roger would approve of. 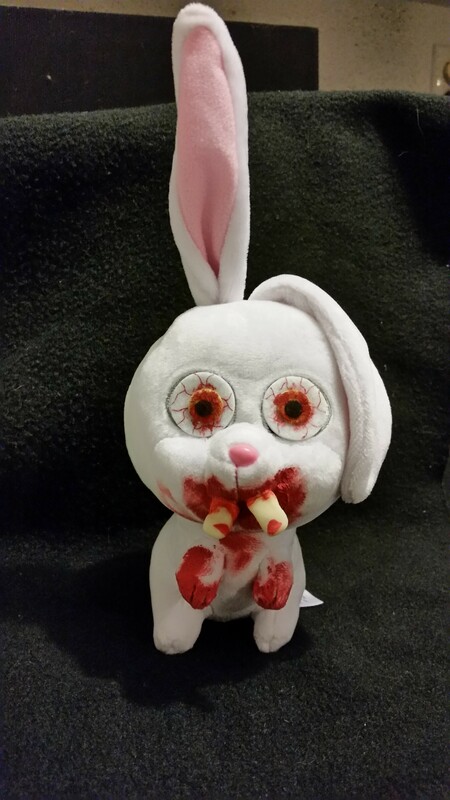 Apparently I have a weakness for killer bunnies! I saw Night of the Lepus soon after and decided I needed a murder bunny! I watched Zoltan, Hound of Dracula and spoiler alert, it has a vampire puppy! I… went… NUTS! 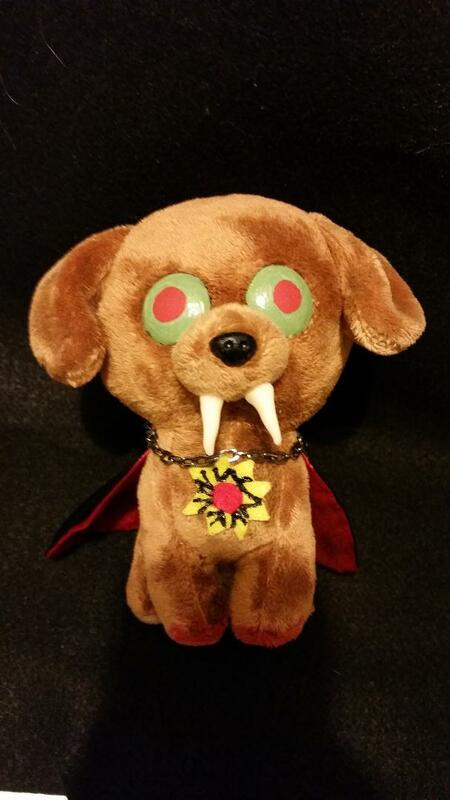 and I had to make a vampire puppy, but it wasn’t good enough to just have a puppy with fangs. How else were you supposed to know he was Dracula’s puppy? So here is Zoltan Jr., Puppy of Dracula! And this is what I consider to be my masterpiece, The Tingler! 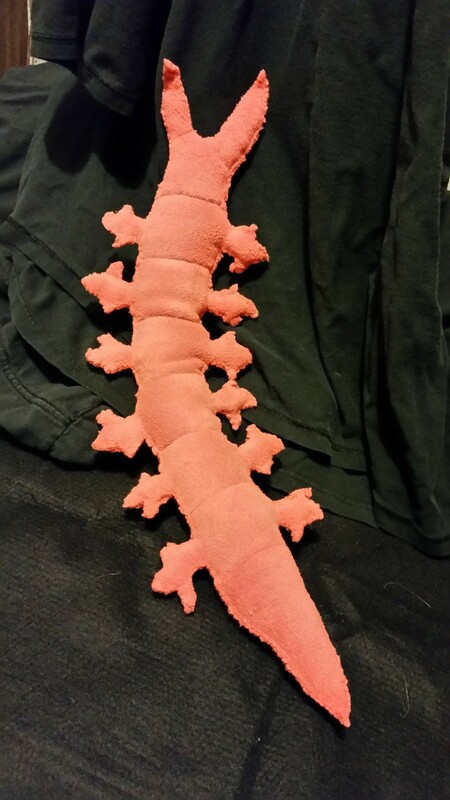 He’s soft and cuddly and you don’t have to scream for your life! But you can if you want to. This is my cat Remy modeling the catnip Kitty Tingler that I sold at the June 2018 Monster Bash. This was made at the special request of a friend. 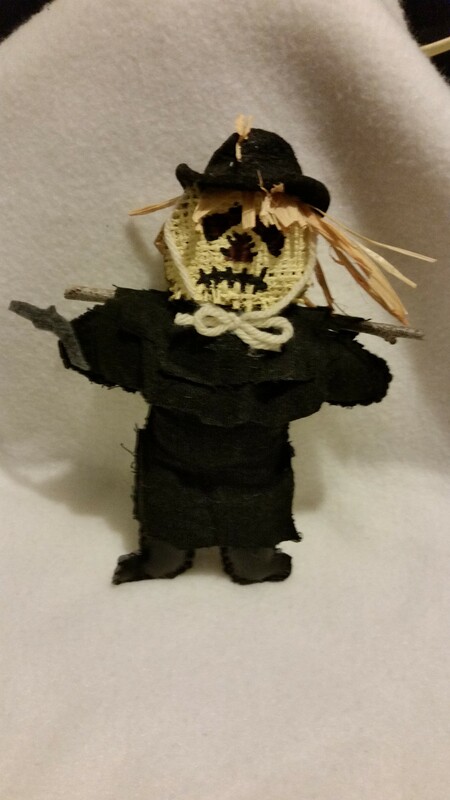 Dr. Syn, The Scarecrow! I actually couldn’t find the movie so I based this entirely off the poster. And I learned A LOT about weathering fabric with this one. 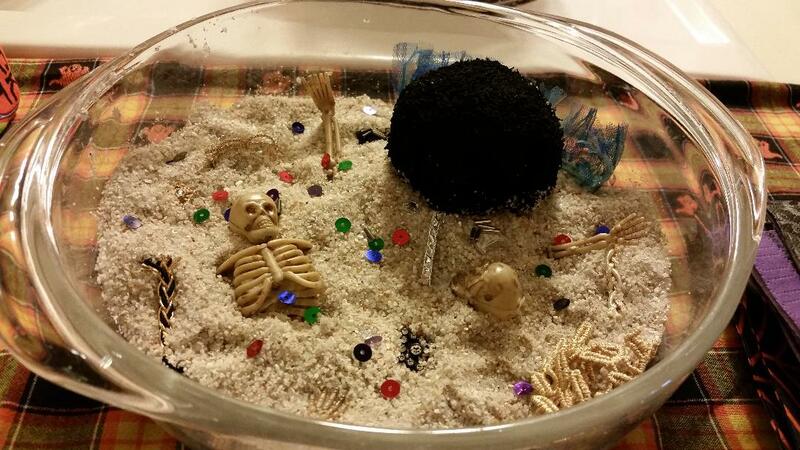 This is the most recent of my movie based fun, a recreation of the lake scene from Caltiki, The Immortal Monster. 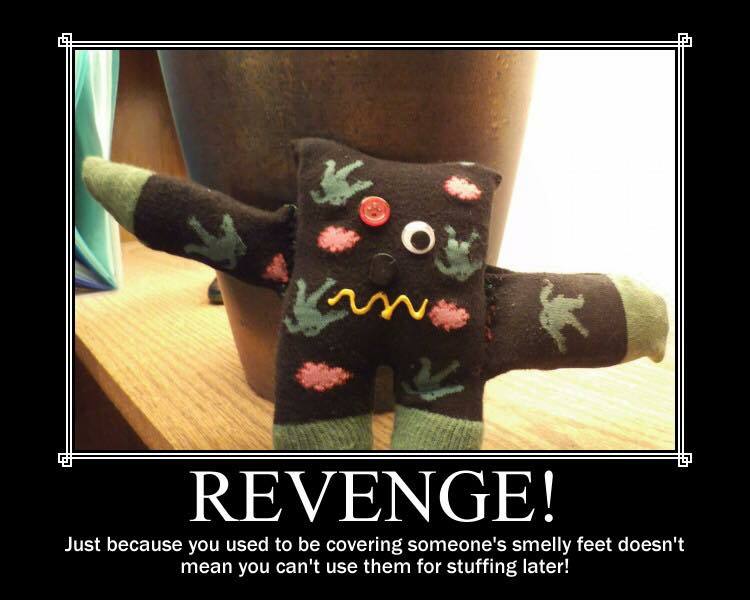 This is a sock zombie I made from a munched up pair of zombie socks. A friend turned him into a meme. 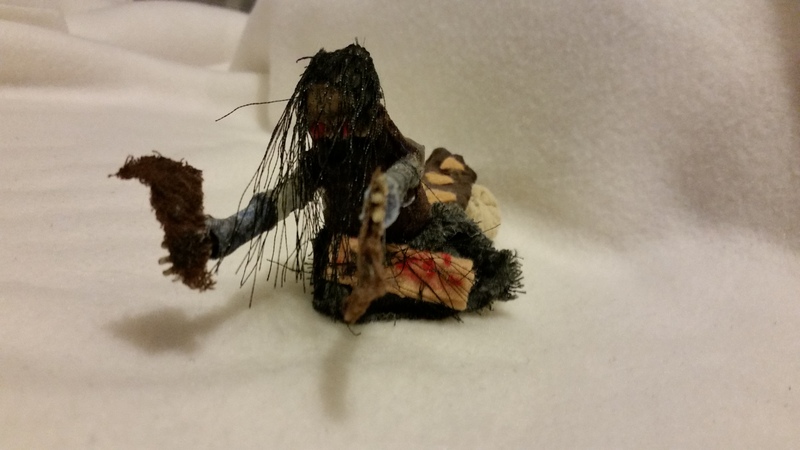 This was made at the request of another friend, a Shoggoth found in the works on H.P. Lovecraft. 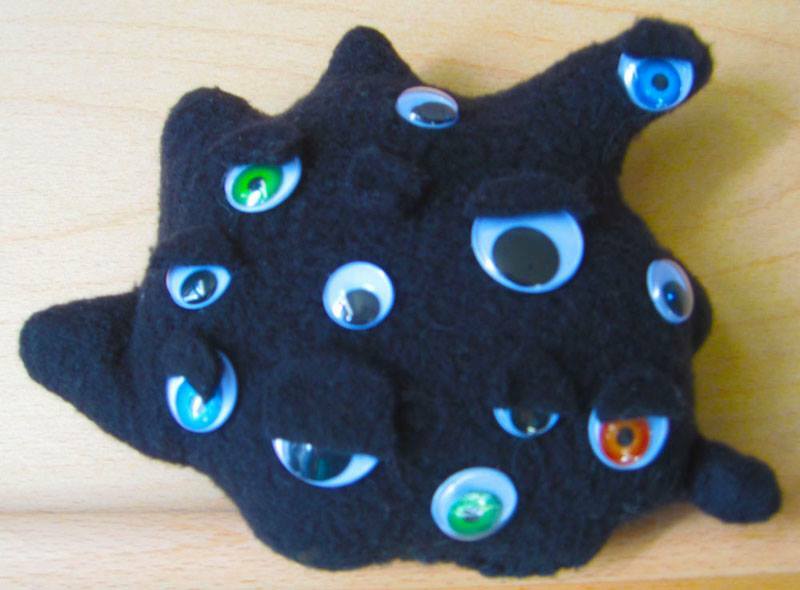 Nothing says eldritch like woogy eyes! 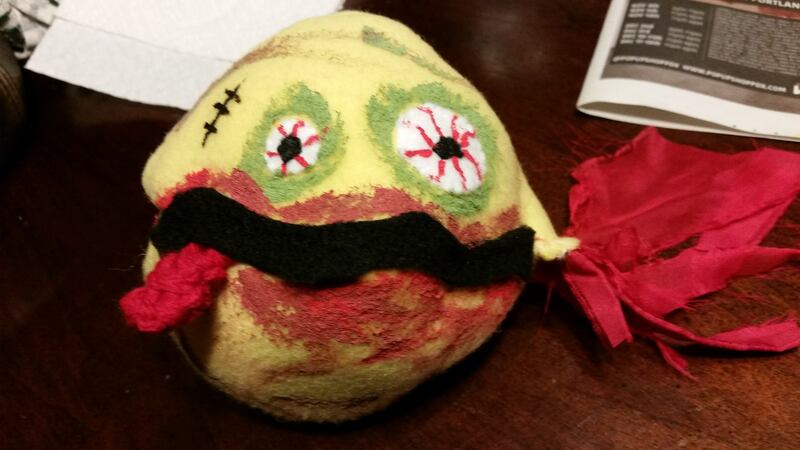 The single most horrifying thing I’ve ever created is the zombie lemon. I did not intend it to look like that. But sometimes misfires can be epic as well. Just in the wrong way. Jeez I’m glad that’s out of my house. Another monster I thought would be fun to make, but certainly took a lot of little fiddly work, was the Giant Leech, from Attack of the Giant Leeches. A College Humor video that was released to promote Jurassic World: Fallen Kingdom gave me the idea to make Emotional Support Dinosaurs. At least you won’t have any trouble getting them on a plane. The Triceratops was a special order that was actually not so easy to make. I created several fringe pillows with monster designs, but this special request for a pillow of Tor Johnson’s character from Plan 9 From Outer Space will always be a favorite of mine. This is a commission (if you can call your Dad saying, “hey, do this” as a commission, which clearly I do) was for a monitor cover for my Dad’s gaming table. The middle is a map of Middle Earth, the surrounding pictures are cut up cards from the Middle Earth: The Wizards game. I now have an Etsy shop. Not all these creations will be available (Humphrass was murder to make! ), but some of them will be. I am more than willing to take requests or special orders, but that is contingent on my ability. I may not be able to pull off what you’d like, but in most cases, I’ll try! Please take a look!